Considered by some as the personification of a howitzer shell with the steely disposition of a tyrant, Louis Félix Marie François Franchet d'Espèrey, was a French General during World War I. Yet outside his tough military demeanor, d'Espèrey was a kind man with, as we shall see, the heart of an adventurer. D'Espèrey, born 25 May 1856 in Mostaganem in French Algeria, was the son of a cavalry officer in the Chasseurs d'Afrique. Following in his father's footsteps, d'Espèrey began his life-long military career in 1876 after being educated at Saint-Cyr. Before the outbreak of World War I, d'Espèrey had already forged a distinguished career. After serving in a regiment of Algerian Tirailleurs (native infantry), he served in French Indochina, and then in China during the Boxer Rebellion in 1900. He was then packed off to France where he was given command of various infantry regiments in France. He obviously did something right, as in 1913 - just a year before the war - he was given command of I Corps. During WWI, d'Espèrey served on several fronts. Most notably, he was given command of the large Allied army based at Salonika. It was in this role that he led "the successful Macedonian campaign, which caused the collapse of the Southern Front and contributed to the armistice" (Wikipedia). After the war his military successes continued with the command of operations against the Hungarian Soviet Republic in 1919. Then on 19 February 1921 he was given the honour of the title of Marshal of France. Skipping ahead to 1924, we find d'Espèrey now in the role of inspector-general of France's North African troops. It was in this capacity that he "became interested in the strategic potential of the "grand axis" north-south route across the Sahara" (Wikipedia). And it was later in this same year that the adventurous spirit within d'Espèrey was unleashed. 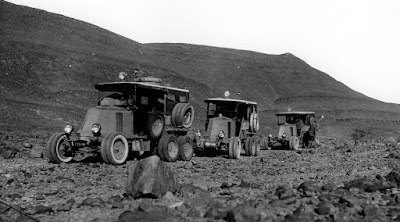 On 15 November 1924, d'Espèrey joined a trans-Saharan expedition led by Gaston Gradis in three six-wheel Renaults with double tyres (see image below). Interestingly, this was Gradis' second trans-Sahara expedition, the first being earlier in that same year. Other members of the expedition included the journalist Henri de Kérillis, commandant Ihler, the brothers Georges Estienne and René Estienne, three Renault mechanics and three legionnaires. Overall the expedition travelled 3,600 km of rugged terrain to reach Savé in Dahomey on 3 December 1924. One can only imagine the stories of the adventures these intrepid explorers had to tell. Any one of them would have certainly made an entertaining dinner guest! 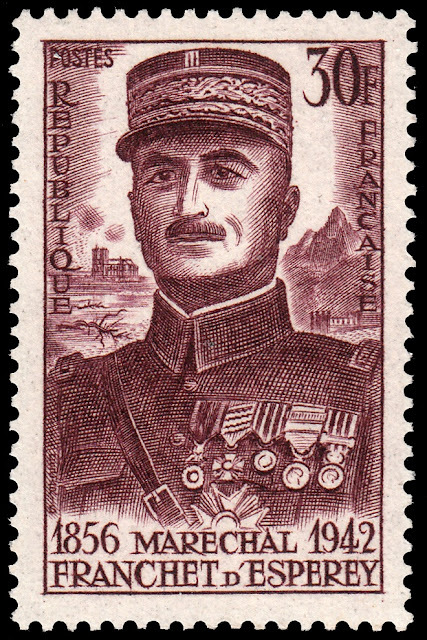 On 28 May 1956 France issued a stamp commemorating the 100th anniversary of the birth of Marshal Franchet d'Espèrey. The stamp was designed and engraved by Albert Decaris. In this design Decaris manages to capture the fierce pride and determination of a great French leader with the heart of an adventurer. It is also worth noting that Decaris has discreetly incorporated one of France's defining landmarks, the Cathedral of Notre Dame. Can you find it?